Dear Fellow Patriots, After meeting you on three tours across America (the Stop Obama tour and Tea Party Express tours I & II) I feel we are family. Though I am black and most of you in attendance at the rallies have been white, we embraced as brothers and sisters because we share conservative values and a love for our country. What I am about to share has little political relevance. It is simply a candid expression of my gratitude and a testimony to how anything can happen in this glorious experiment called America. Last Christmas, because I was selected by my congressman to decorate an ornament for the White House Christmas tree, my wife Mary and I were invited by Laura Bush to a reception at the White House. The White House sent me a six by six inch silver plastic ball with specific instructions. The theme of my design must reflect my state (Florida) in a red, white and blue color scheme. Also, the decorated ornament must be returned by a specific date in the same box in which it was delivered to me. My design was pretty neat, if I do say so myself; stars, palms trees and water all done in thousands of tiny beads. A great bead artist, Jenny Shibona, implement my design. 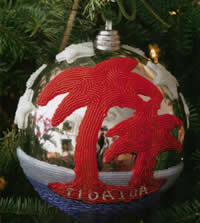 Artists across America selected to decorate ornaments were invited to the reception hosted by First Lady Bush. Getting through security took awhile, but not too long. The White House was wonderfully decorated, each room more beautiful and spectacular than the other. The food and desserts were delicious and elegantly presented including a white chocolate replica of the White House. Mrs. Bush's three hundred or so guests enjoyed Christmas music played by a young soldier on a grand piano. I asked the pianist if she knew "The Christmas Song" and could I sing it? Amazingly this courageous trusting young pianist invited me to sing as she accompanied me. Judging from the applause, we were a hit. Wow, my first unofficial performance at the White House. Shortly after my performance, Mrs. Bush made her grand entrance. Everyone flocked to her as a chorus of cameras flashed. Laura delivered a charming speech thanking us artists. The staff photographer took a picture of each artist and their date/guest in front of the official White House Christmas tree which was later mailed to us. The waiters had a very polite way of informing us when the reception was over. Waiters stood in both entrances of the buffet room. When guests tried to reenter, "Excuse me, this room is closed." It was a truly wonderful and memorable evening. The most amazing thing about our White House visit was Mary and I were homeless five years earlier. Through making a crazy impulsive decision to quit my job of 15 years as a graphic designer and supervisor at a TV station to pursue a music career, we fell upon extremely hard times. Only in America could I become internationally known and dining at the White House. Our journey is also a great testimony to God's Grace, Love and Faithfulness. I share details of our incredible journey in my soon to be released book, "Confessions of a Black Conservative: How the Left has shattered the dreams of Martin Luther King, Jr. and Black America." Mary and I left Washington DC and drove to the hills of West Virginia to visit her parents. After a lovely few days with her folks, we prepared to fly home to Florida. Mary's mom's computer was broken so we could not download our boarding passes. We were forced to drive10 miles to Mary's sister's office to use a computer. To get there, Mary's mom instructed, "Take Grassy Lick Road." As Mary drove the extremely hilly and winding road, we kept losing the radio signal. So, we turned the radio off. We didn't see a single soul; only small farms, horses and black cows eating grass. "Oh honey look, there's a deer" yelled Mary. Then we saw two, and two more, five deer in total. A slight chill was in the air. We smelled someone using their fireplace. When we finally reached the main highway, we realized that beyond the acknowledged deer sightings, we hadn't spoken our entire cruise down Grassy Lick Road. We rode in silence enjoying the subtle sounds of nature. Mary and I almost simultaneously turned to each other and said, "Wow, was that awesome or what!" That little detour was so beautiful, relaxing and peaceful. What appeared to be a negative, her mom's broken computer, turned out to be a lovely little gift from God. I'm learning to view more of life's detours in a more faith filled light. Our years of struggle since quiting my job in 1993 have forced Mary and I to grow up. In our youth, we were ungrateful and arrogant; funny how hardships teach you gratitude. We have acquired a greater awareness of blessings; not just the big blessings, but the small ones like Grassy Lick Road, a supportive phone call when you really need it and winning the bid on eBay for that perfect gift for a friend. We have also learned that true happiness is found in surrendering to God's purpose for our lives. As we enter this holiday season, Mary and I are extremely mindful of how far we have come thanks to God and being blessed to have been born in the greatest nation on the planet. I am looking forward to continuing my "Million Handshake March" while on "Tea Party Express III Tour: Just Vote Them Out," which launches March 27th. I can hardly wait! Have a Very Merry Christmas and a Happy and Blessed New Year!